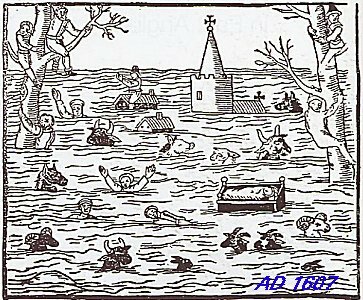 Flooding on the Dorset Stour at Bear Mead. go to Twitter and look for #DorsetStourPeak. This private website gives measured river and groundwater levels, together with expected arrival time at Bear Mead, of any sizeable rain-surge coming downstream. Compiled by the landowner at Bear Mead . 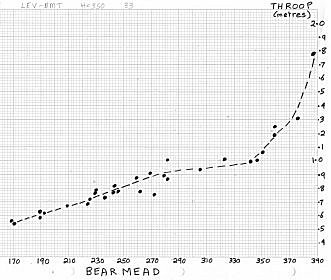 Bear Mead is located 1.5 miles upstream of Wimborne Minster on the South Bank of the Dorset Stour, immediately West of Eye Mead (National Trust) and North of the A31. It is a private Nature Reserve of 25 acres, 5 hedged pasture fields of flat flood plain with an oak and willow plantation. 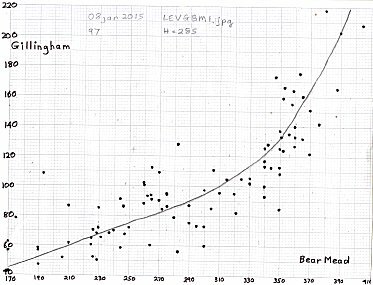 It partly floods when the river height is greater than 350.
measured at Bear Mead 50 miles from the source. 1. 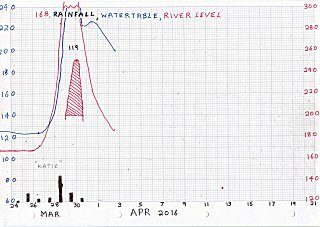 River and groundwater levels. in the floodplain 223 yards from the river. Bear Mead Nature Reserve is closed to wheeled traffic when the groundwater level is above 170, due to soft ground. Always use the perimeter track, not the open fields. 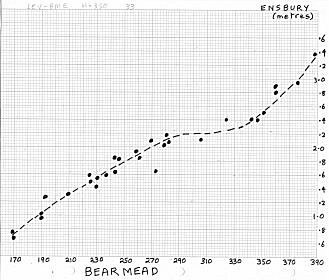 Height of peak at Bear Mead can be used to estimate height of peak at Ensbury or Throop (but not Wimborne), using these relation graphs. 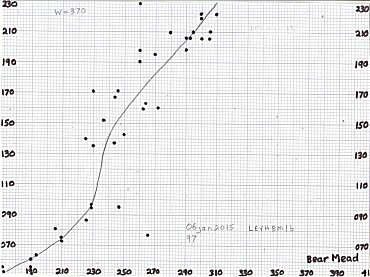 A Graph is not included because level readings for Wimborne are not reliable. Movement of the sluice at Canford School affects level readings at Wimborne Monitoring Station 0.5 miles upstream. The sluice is often adjusted by school staff near high water to help remove snags caught in the weir. 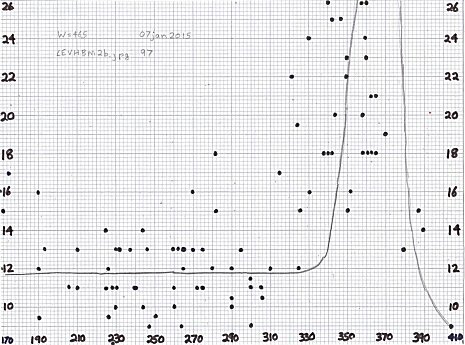 Graphs of over 10 examples of this practice can be supplied on request. The sluice is also often adjusted at low water to normalize river levels near the school. 3. 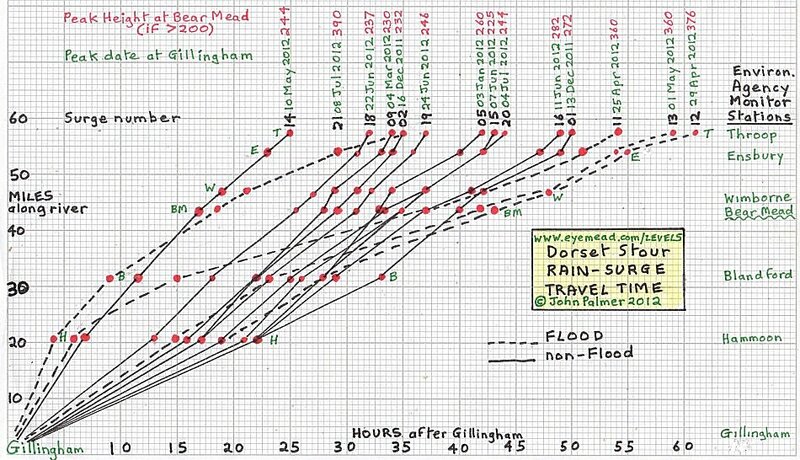 Estimation of rain-surge delay (between Gillingham and Throop). 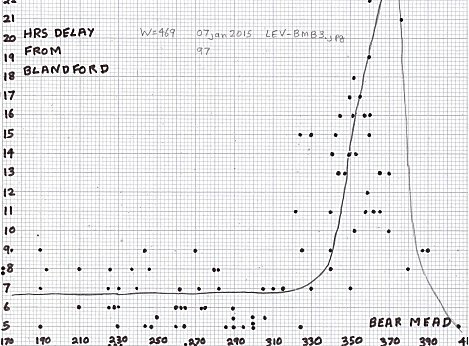 Some records of peak arrival delays (relative to Gillingham) on reaching Hammoon, Blandford, BEAR MEAD, Wimborne, Ensbury and Throop. 57 miles of the Dorset Stour. 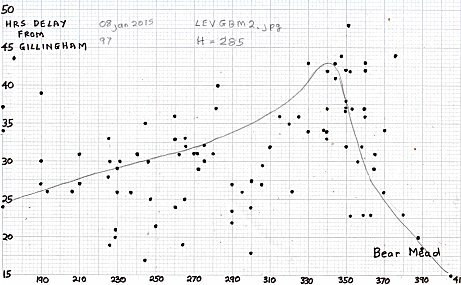 150+ Environment Agency graphs, from which these records are derived, are held for private use by the webmaster. seeing this type of feedback.